Most parents have wondered at one point of another if they should allow their child to cut with a pair of scissors. But what if they decide to cut their hair off? Or what if they snip a hole in their best jeans? It can be a real struggle to allow your child to hold and use a pair of scissors! Scissor skills are not easy skills to master! Many children start out holding and using scissors with an awkward grasp. They might switch hands when they hold the scissors or they might nip their crafts into a billion pieces because they can't control or grad the force needed to snip and cut. That's why I'm excited to bring you The Scissor Skills Book! The child who struggles with holding scissors again and again. The child who holds the scissors up in the air to attempt to gain control. The child who snips their cutting worksheets into a million pieces. This child who tears the paper as they cut and seems to plow the scissors through the paper. The child who can not grade their cuts and over cuts lines or has jagged cutting lines. The child who snips corners from shapes. There are many different ways that kids struggle with scissor use and accuracy when cutting with scissors. Kids with underlying developmental difficulties need to go through the process of learning to use scissors and can experience struggles during that development, too. Children who have developmental or neurological difficulties that impact scissor use will experience difficulty coordinating fine motor skills, gross motor skills, visual perceptual skills, visual motor skills, sensory processing skills, attention and behavior, and cognitive functions while cutting with scissors. All of these areas are addressed in the new book by the Functional Skills for Kids therapy team. 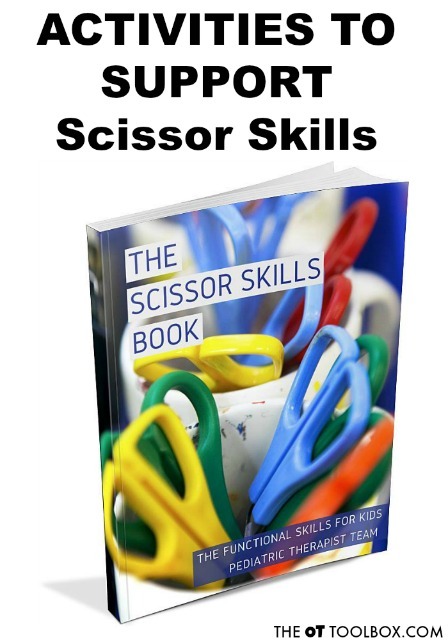 Ten Occupational Therapists and Physical Therapists have gotten together to write The Scissor Skills Book. It's a book with resources for every underlying area needed for scissor use. 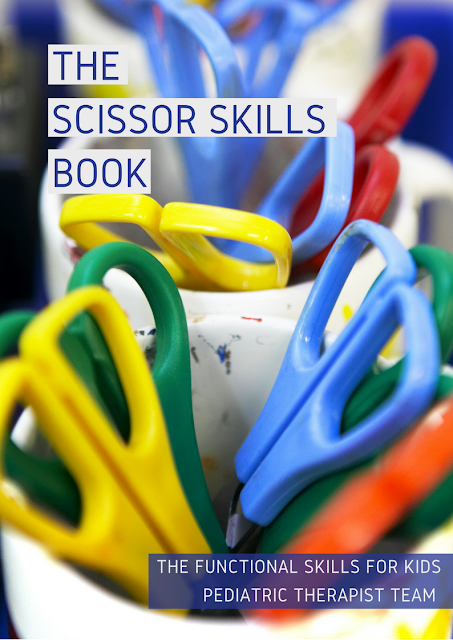 It's got tons of motor activities to address the areas needed for scissor skills. There are pages and pages of accommodations and creative ways to work on scissor use. 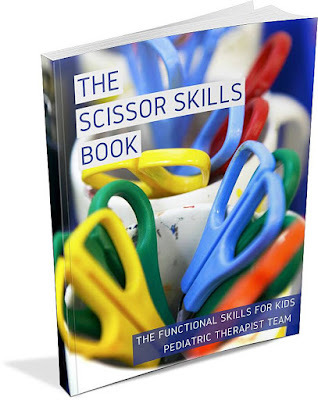 This e-book is a giant resource for anyone who works with kids on cutting with scissors! The therapists behind the Functional Skills for Kids series include a team of 10 pediatric physical and occupational therapists with years of experience in the field. Together, we have created the ultimate resource for tips, strategies, suggestions, and information to support scissor skill development in children. Read more about The Scissor Skills Book here. The launch week discount lasts from May 1- May 8. Get The Scissor Skills Book on sale now! Click on the Buy Now button to purchase The Scissor Skills Book for $11.99 for one week only!